Kenro has announced that they are launching a new film scanner from Reflecta in the UK. The film scanner is called Reflecta x4plus-Scan and comes with a 9 megapixel CMOS image sensor. In addition it has 2.4” LCD display, card slot for SD and SDHC memory cards and a lithium battery. The Reflecta x4plus-Scan film scanner is available right now for about £160. Kenro has announced the launch of the Reflecta x4plus-Scan, the latest film scanner from Reflecta, the respected German manufacturer of cutting-edge digitization products. The x4plus-Scan features a CMOS image sensor which utilises Instant Photo Capture technology (as in a digital camera) to provide quick scans (2 seconds for a colour scan at 1800 dpi). It is suitable for scanning photographic 35mm transparencies and negatives and also pocket film (110). This new addition to the Reflecta range features a 2.4” LCD display, an integrated SD/SDHC card slot and a lithium battery that allows the scanner to be used independently from a computer or power supply. Completed scans can be stored on an external memory card or transferred directly via the USB port and cable provided. Boasting an optical density of 3.0 Dmax and a 30 Bit colour depth the x4plus-Scan can be set to 2,400 dpi which is the equivalent of a 9 megapixel image. The unit come complete with image editing software, ArcSoft MediaImpression. 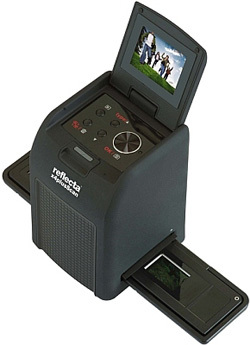 The scanner comes supplied with film holders for three framed slides up to 3.2mm thick, film strips up to six exposures and for 110mm film strips up to eight exposures. The x4plus-Scan is available now with an RRP of £160. Other products in the Reflecta range include digital microscopes, endoscopes, video and studio lights, USB record players plus its renowned selection of slide projectors. Kenro is the UK and Ireland distributor for Reflecta. If you would like further information, or want to find your nearest stockist, go to http://www.kenro.co.uk or call 01793 615836.